If you haven't shopped at thredUP yet, now would be a great time to do so! 1st time customers can take $15 off their 1st order using the code HOLIDAY15. With this code, you can get name brand kid's clothes for only $1.98! = $7.91 for 4 items of name brand clothing, or $1.98 each! 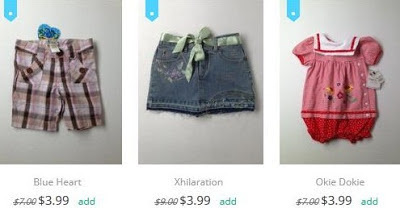 In case you didn't know, thredUP is an online consignment store for name-brand kid's clothes. I have order from them many times and have NEVER had a problem with any of the clothes I've received. They have very strict guidelines in what they offer to customers. NOTE: It's easy to find NEW with tag clothing on this site, like the 3 pictured above. Just look for the little blue tag in the left corner. Click here to check out all the awesome deals!